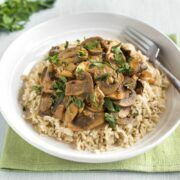 Mushroom stroganoff is one of my favourite easy dinners (you may have noticed that I post about it a lot on the blog!). 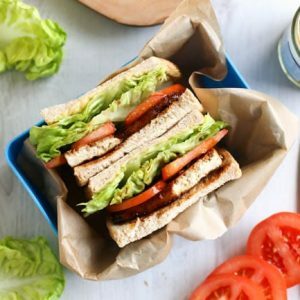 It’s pretty healthy, it has tons of flavour, and this version is especially quick and easy to make! It can be on your table (or in your face) in about fifteen minutes – just my kind of lazy dinner. Stroganoff is a Russian dish that’s usually made with beef. It has a creamy sauce made from sour cream. As with most classic recipes, there’s not one ‘right’ way to make stroganoff – different countries have put their own spins on the recipe, and no two stroganoffs will ever be alike. That’s actually one of my favourite things about this dish – you can really make it however you like and call it a stroganoff, and it will almost certainly be delicious. As you know, I’m not a stickler for authenticity when it comes to my cooking – as far as I see it, food should be enjoyed, so as long as I end up with a tasty meal at the end of it, I’m not fussed whether my recipe is 100% accurate. 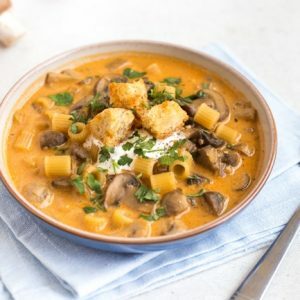 This vegetarian stroganoff obviously doesn’t include the usual beef (although you could totally make one with vegetarian beef-style pieces if you wanted to!) – instead, I used a vegetarian’s best friend, mushrooms! 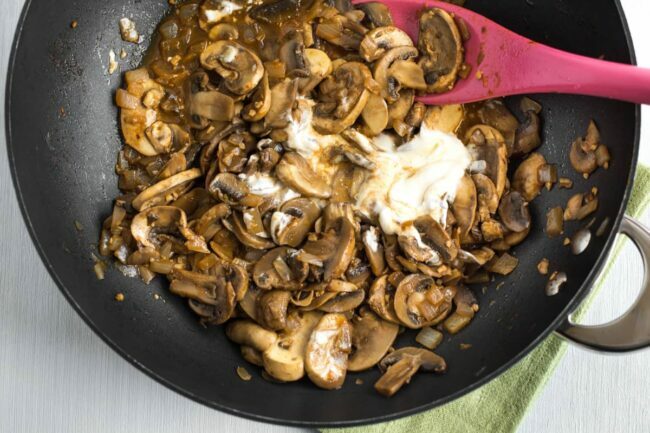 Mushrooms are super cheap, they have a nice ‘meaty’ texture (meat-eaters, don’t tell me off), and they cook down beautifully to give the sauce a really lovely flavour. Plus, they’re really good for you! First, cook the mushrooms with some onion and garlic. Just three ingredients in, and you’ve already produced one of the best smells in the world (cook them in butter if you want them to be extra irresistible!). Then, add some smoked paprika. It’s my favourite spice in the whole world – I’ve been told off (jokingly!) on numerous occasions for putting it in just about everything I make. 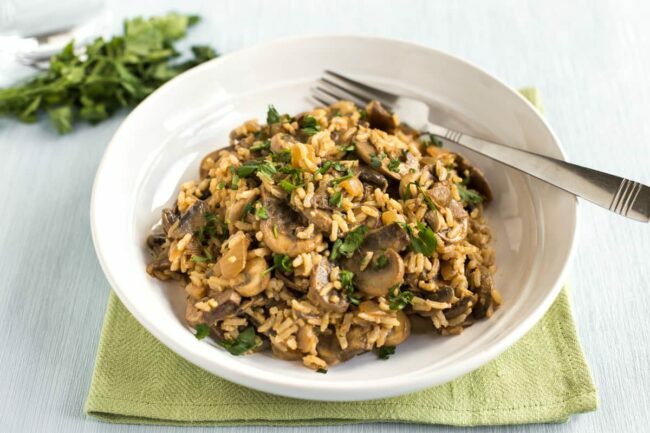 It’s got such a lovely rich, smoky flavour, and it’s all you need to bring your mushrooms to life and turn them into a really tasty mushroom stroganoff. You could use regular paprika if you can’t find the smoked stuff, but I’d definitely recommend using smoked if you can find it – the two don’t even compare. Finally, the all-important sour cream to make everything super creamy. That’s all there is to it! The whole dish comes together in about 15 minutes – maybe 20 if you’re particularly slow at chopping veg (but you can’t blame me for that). 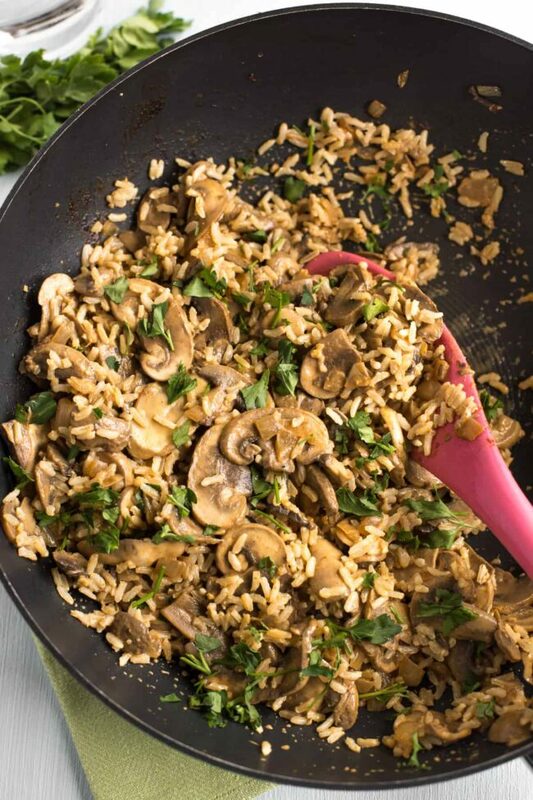 This 15 minute mushroom stroganoff is just the kind of quick dinner I love after a long day – spend a few minutes slicing mushrooms, a few minutes sautéing, and you’re basically done. Even I can manage that. 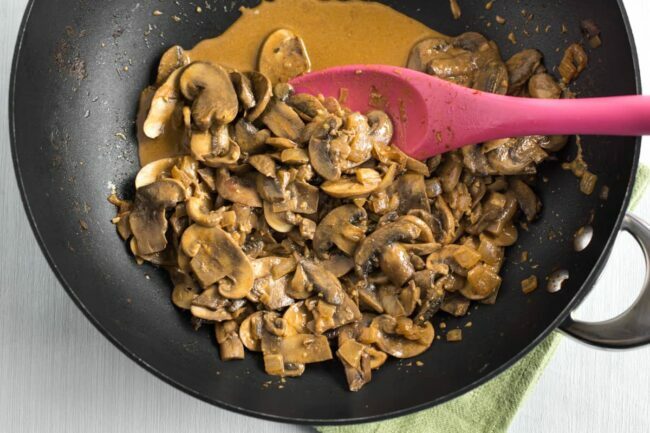 How do you serve mushroom stroganoff? Stroganoff is typically served with either rice or pasta – often tagliatelle. It’s fantastic either way. You can either plate it up nicely over your chosen side dish, or mix everything together in the pan. I actually prefer it all mixed together (though it’s a bit less pretty that way! ), so you can make sure all of your rice or pasta is nicely coated in the silky sauce. 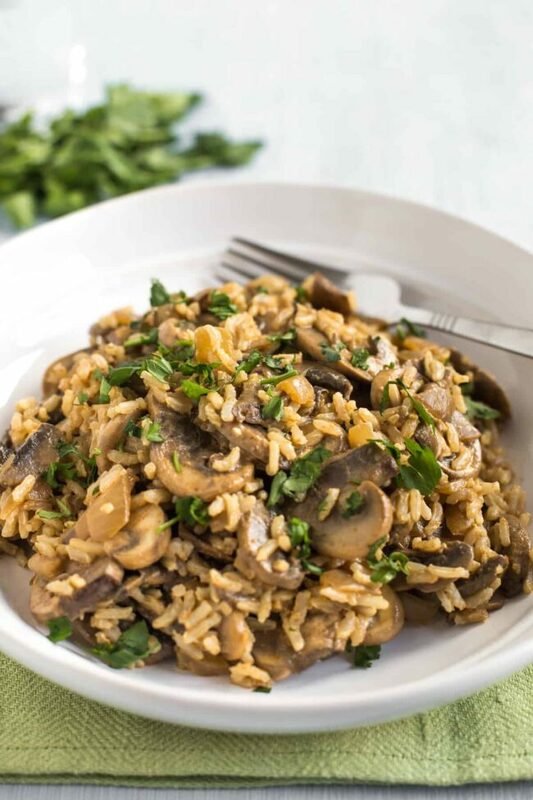 If you’re not a mushroom fan, or you just fancy a bit more variety in your dinner, feel free to mix things up a bit! 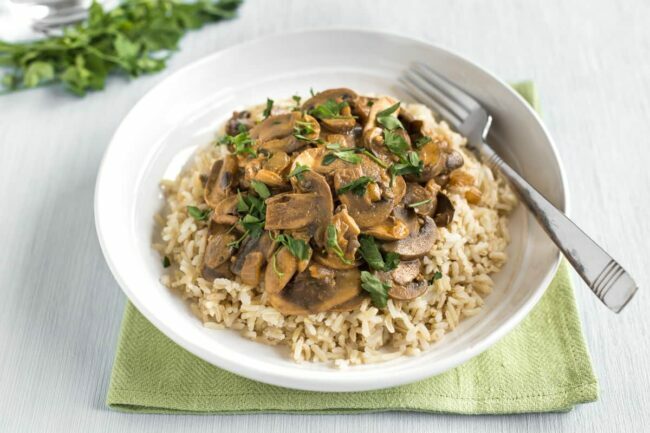 You could pretty much put whatever vegetables you like in your stroganoff – you don’t have to stick to just mushrooms. Basically, if you smother it in this creamy, smoky paprika sauce, it’s going to be delicious. Heat the oil in a large frying pan or wok, and add the onion. Cook for a few minutes over a medium heat, until slightly softened. Add the garlic and sliced mushrooms, and cook for a further 5 minutes, or until the mushrooms are thoroughly cooked. Coat the mushrooms in the smoked paprika, then add the vegetable stock and sour cream. Bring to a gentle simmer, and cook until the mixture has come together into a silky sauce. Season to taste, and serve topped with plenty of fresh parsley. Note: Nutritional information is approximate, and will depend on exactly what ingredients you choose. Information above is for 1/2 the recipe, not including rice or pasta. 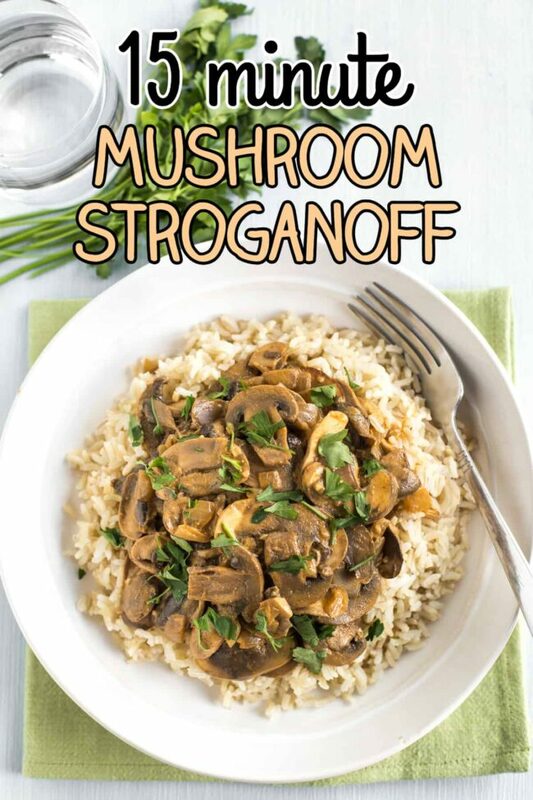 Hooked on stroganoff? 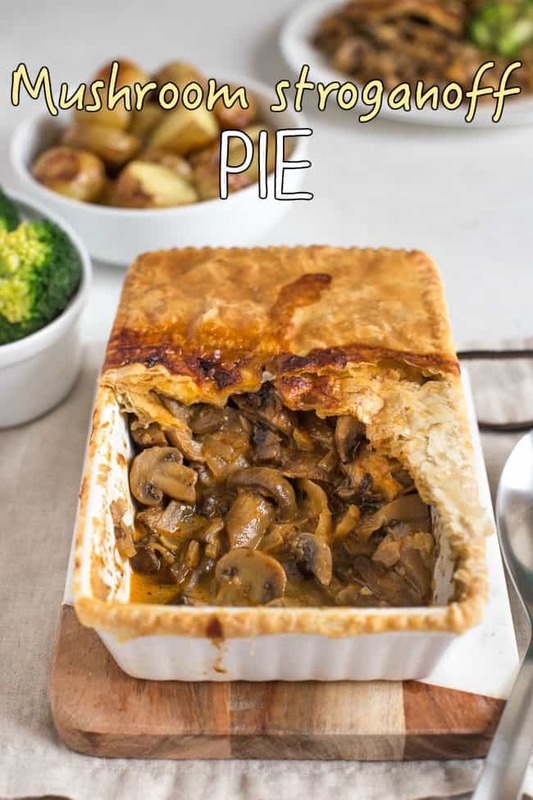 Try my creamy mushroom stroganoff pie! Nice one. I like it and I GOING TO TRY IT. I made this the other evening. It was late, had a long day and rustled this up. I put the rice on first and then made the stroganoff. My partner wolfed his down. Definitely going to be a regular meal. I used chestnut mushrooms. Worked really well. And sorry, not sure how I managed to link to my old blog there. Me and technology, never a good combination!!! I tried it. It was excellent. I used both fresh and dried mushrooms. Used the water from the dried mushrooms (after soaking to soften) as stock. I also just used milk with abit of wheat flour as a thickener as I dont like the richness of cream. It was awesome!! I have made this dish on a number of occasions and have previously sung the praises of this recipe on this blog. 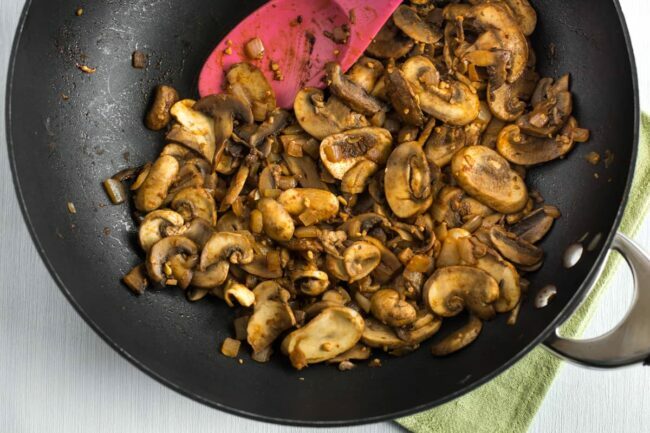 If you have no vegetable stock to hand and have used portobello mushrooms, or for that matter any dark gilled mushrooms, just add 50 ml of hot water from the kettle with a little salt. The juice from dark gilled mushrooms works very well with hot water to form its own stock. Just as delicious when cooked. I have made this recipe many times. It’s one of my favorites. …and so easy to make. Great to know, thanks Terry! Thanks for your kind reply to my recent posting on the fifteen minute mushroom stroganoff recipe. I know you are a cheese loving vegetarian. The one thing that I do not like is cheese, (both of my parents ate it but neither my brother or my niece like it). So many vegetarian recipes are based on cheese. Is there anything that I could use as a substitute. I anticipated a reply in these terms. I know a number of cheese substitutes for creamy sauces, (or tomato sauces) with a cheese base. My difficulty arises with recipes that need to be baked or those recipes with a cheese gratinee. Absolutely delicious! I had some mushrooms to use up and decided to follow this recipe. It is easily adaptable for one serving by using less mushrooms and slightly less sour cream. This really is the fast food of the twenty-first century: a meal on the table with basmati rice in fifteen minutes; how good is that. Thanks for this recipe. I loved it; very healthy too. I was wondering if I was to take it for lunch to work, you think I could add the sour cream at night and heat it up the next day? Found this through Google. I will try it but with the slight difference that I will add less garlic, but it will be raw and I will add it at the end. So I could feel it and I think this might really imbue the whole thing. I’m a sucker for mushrooms anyway. Good recipe, I approve! Is there nutritional information for this recipe? I wish recipes used Ounces, how much is 500ML ?? 500ml is about 2 cups, not sure what it would be in ounces – do you use fluid ounces or just normal ounces? Not the way I would usually measure a liquid! 500g is about 18oz. 454g is 16oz or 1lb and so the other 46g is about 1 and 3/4oz. 50ml of stock is 3tablespoons and one teaspoon’s worth. Do you think soft cheese (maybe with added milk) would be a decent substitute for sour cream? I just have some soft cheese in the fridge that I’d like to use up! Hmm, to be honest I think it would be a little different using cream cheese – but I’ve made mushroom sauces with cream cheese lots of times and it’s always delicious, even if it’s not exactly a stroganoff, so I say go ahead! 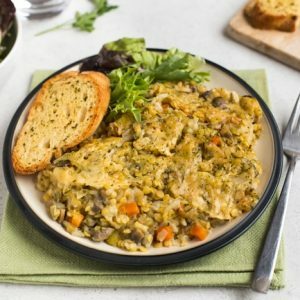 I was searching some main dish with mushroom, and as a single -kinda lazy- guy, this recipe is amazing! This recipe is SO GOOD!! it is fast, easy, inexpensive, and delicious! I’ve made it four times already and it has a permanent place in my meal rotation—thank you so much!! Yay! Thank you! :) So pleased you love it as much as I do! I’ve made this twice now. Last Saturday, I had only about 350g of fresh mushrooms, so I used some mixed dried mushrooms and used the soaking liquid instead of the stock. This made it even yummier. I also used a mixture of creme fraiche and Greek yoghurt as it was Empty the Refrigerator Night and there wasn’t much creme fraiche left. Sounds great! Glad you liked it :) I need to have Empty the Refrigerator Night, always so much random stuff hiding in mine! I’m going to make this tonight. This recipe calls for 50ml of vegetable broth. I’m wondering if it’s a typo because your crock pot recipe calls for 250ml? Please let me know asap. Thanks. Hi Michelle! I think the recipe is right, it only needs a splash :) But feel free to add more liquid if you’d like it to be saucier! Enjoy! Quinoa sounds like a good addition! Glad you enjoyed it :) Make sure you take a look at my other recipes too! Hi,it looks yummy and definitely will try..But the rice looks yummy too :) can I have the recipe please? how much salt did you add? Just a good pinch :) It really depends on how salty you like your food – just add a little and then taste it to see if you need a bit more. Do you recommend using greek yogurt instead of sour cream for this recipe? Thinking of making it this weekend, thanks! Stroganoff usually uses sour cream but I imagine Greek yogurt would work fine :) enjoy! My tastebuds say that Greek yogurt is too sour, I would use regular yogurt and drain some of the whey out of it to make it thicker and less sour. To drain yogurt, take a medium-size strainer and set it over a bowl. Gently spoon the yogurt into it, breaking up the yogurt’s structure as little as possible; this is important so that it will drain properly. Set the bowl and strainer aside at room temperature while you cut up vegetables and do the rest of the cooking. The yogurt will become thicker the longer it drains. 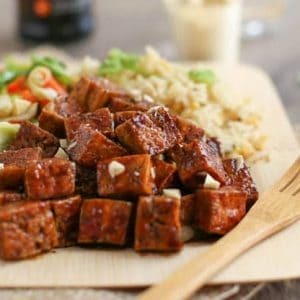 How would you go about adding tofu to this recipe? I have some sitting in the fridge waiting to be used and this seems like a good opportunity to put it to use! did a test run with the kids as I have six coming over for our weekly movie night tomorrow and we loved this. Found this on Pinterest recently, been dying to try it. We ate it last night finally. It was really making me wish I had made more, because it was so good. I’m with all the others, it was so easy! I had to wait for the 20 minute rice. This is way better than any takeout if you don’t think you have time to make something. The only other thing I thought maybe to try next time would be adding a splash of dry red wine to it as it cooks, to add just a touch more flavor. Yay thanks Melanie! So glad you enjoyed it :) A dash of red wine sounds like a GREAT addition! Made this today. I put it over brown rice pasta for a healthy alternative. I accidentally used broth instead of stock. Would there be taste differences ? I used creme fraiche instead of sour cream. It turned out very well, I’ll be making this again. Just tried the recipe and it was good! Probably not as good as yours though since I added turkey and had to substitute a few ingredients (apparently I need to do some serious grocery shopping). Other than that the recipe did turn out great and definitely would make it again, but next time I’ll be sure to use original ingredients that you listed. Anyway thanks for sharing your recipe, here’s my experience of making your mushroom stroganoff (http://www.oddcoconut.com/pinterest/mushroom-stroganoff-with-turkey/). Any way we could make this vegan???? I’m pretty sure you can get vegan sour cream! I think I’ve heard of one by Tofutti? Don’t think you can get it in the UK though, not sure where you are? I am a big fan of DIY vegan cashew sour cream. (I don’t like all those gross chemically vegan things). Not sure how the texture will work in this dish, but should taste delicious! 2.Pour off water and place cashews in blender with fresh water, salt, apple cider vinegar and lemon juice. 3.Puree until very smooth and creamy. 4.Refrigerate until needed. Will last up to 1 week in the fridge. As a student my stomach thanks you, this is very nice. I added X 4 times the stock and dumped my rice into the same pot for a complete meal. I did not have sour creme on hand so substituted Greek yogurt instead. 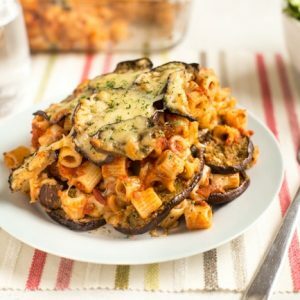 easy meal and yummy too! 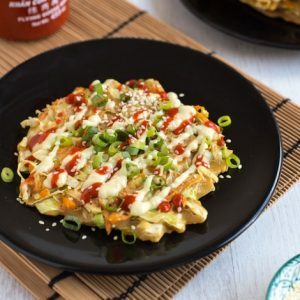 I love how you turned a classic dish into something so unique! This looks delicious! i love quick meals! yum! 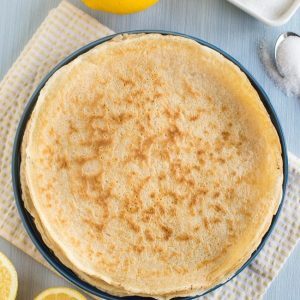 I love this simple recipe! Perfect weather for it too. Can’t wait to give it a try.